Hopefully, if all my standby flights worked out, at the time this post is published I will be sitting in Robyn Spady’s inkle weaving class at CNCH. 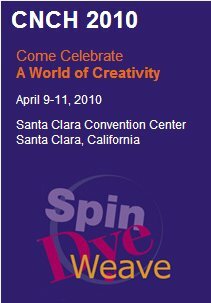 (Conference for Northern California Handweavers) My first such event! – very excited. This will be my first experience with an inkle loom and, hopefully, it will be better qualify me to answer those questions I often get about transferring pick-up techniques normally woven on backstrap looms to inkle looms. 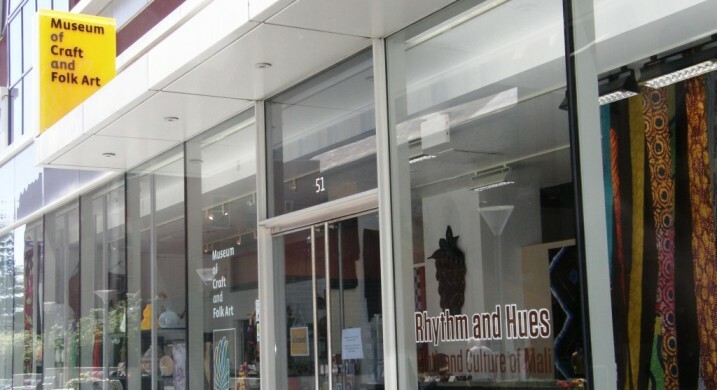 On Saturday, I will be taking Syne Mitchell’s rigid heddle class and the rest of the time I guess I will be looking at all the goodies on display, seeing Weavolution members in the flesh for the first time at the meet-up, perusing the galleries and taking lots of pictures to share with you all here at some stage. So, as I write this here in Santa Cruz, Bolivia I am thinking it is time for me to get my “on the road” crafting stuff together. I always take my backstrap gear along with me and, when there really isn’t anywhere I can hitch my loom, I braid or spin. 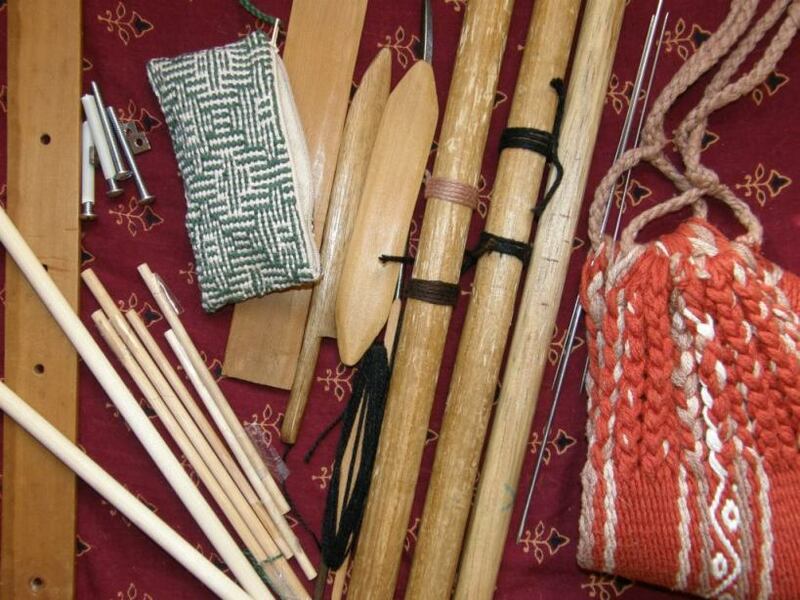 Backstrap weaving stuff to take traveling. Weaving literally on the road near Potosi, Bolivia. I went with friends to the village of Calcha near Potosi to meet with weavers. On the way back we had to sit for hours on the side of the road waiting for a ride and finally got to travel back to Potosi in the back of a truck. We passed the time by hitching to a convenient dead tree and weaving. We had bought a sheep skin in the market in Calcha so we could pass the night sleeping on the floor in the hospital! This made a nice comfy seat for weaving. One lady who lived right near the main road where we were waiting came along to see and was enchanted! I see that there is something I forgot to include in the photo – several flat non-stretchy shoelaces to tie the loom bars to a fixed object. I usually take a project already warped up and then my mini warping board goes along for when I get through that and want to start another. The mini warping board with its removable screw “stakes” is on the left. Moving from there to the right, I have several thin dowels for cross sticks and heddle rods, my new shadow weave sewing kit purse, three beaters, a large curved needle, my new belt shuttle (thanks Lydia! ), two loom bars and a roll up rod, metal rods for three-selvedge pieces and my backstrap. I also take a small bottle of white glue so I can finish the braids on keyfobs and bookmarks. I usually pick up yarn on the trip so I can try out new stuff. 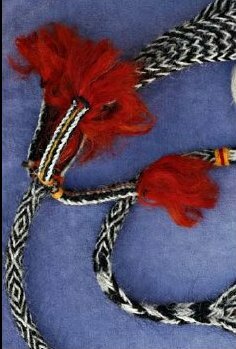 I was recently sent this image of a Tibetan nomad sling. I am no braiding expert but superficially, at least, the braid on the left looks exactly like the Margarita braid that I learned in Peru. No, I am not going to pop a marudai, the piece of equipment on the left, into my backpack. 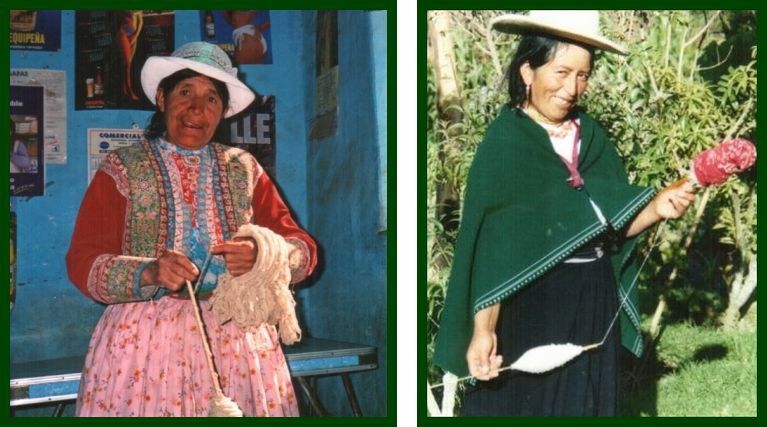 Thanks to my teacher, Zacarias in Peru, I can make the nice Palma and Margarita braids used to make slings in Peru (which I first showed you in this post) with those two pieces of equipment on the right. 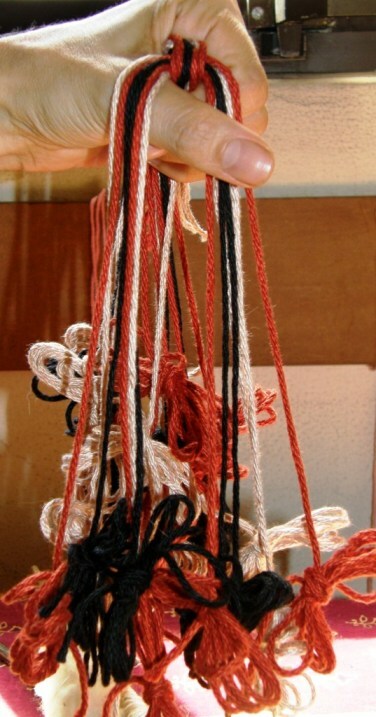 Of course there are other ways to braid the 24-strand braids without the use of cumbersome equipment. Rodrick Owen shows you in his Braids 250 Patterns from Japan, Peru and Beyond how to make them using notched cardboard squares and circles to keep the strands nicely in order. 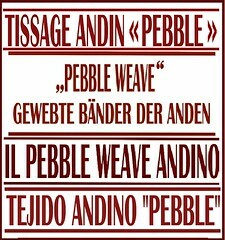 Perhaps you listened to the recent WeaveZine weavecast with Roderick Owen. 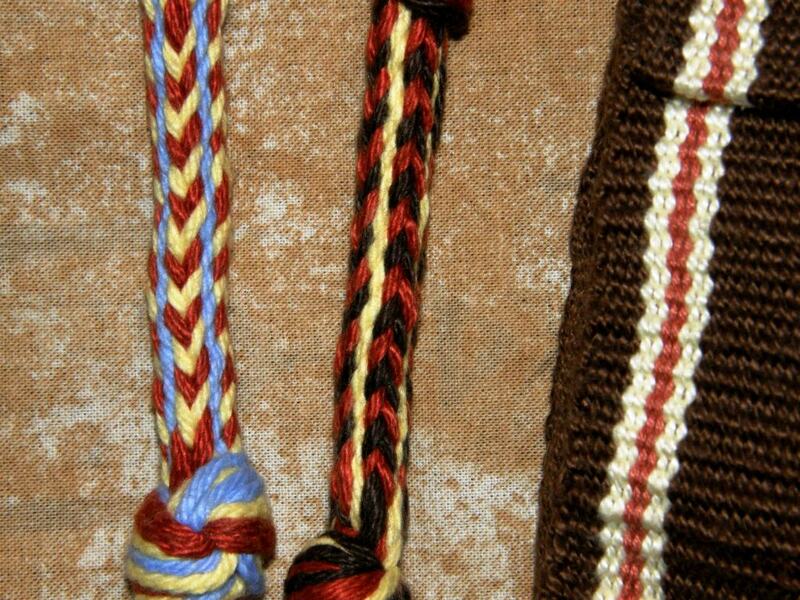 I am going to show you by video today how to work the 24-strand Palma braid as I was taught in Peru by a sling braider. The fiber used in the sling braids is generally llama and the strands are fairly thick and, therefore, easy to manage in the hands. I don’t imagine it would be quite so easy with fine yarns. The video has been split into two segments. The technique has four parts so you will see parts one and two on the first video and the other two parts on the second one. The idea of the videos is to show you the movements of the strands. I am not showing you there exactly how my teacher held his hand as he braided as the crossings were not so clear on the video that way so I will show you that in a still shot later. Two Palma braids made with 12wpi cotton. I am going to use the one on the right as a strap for the bag which you can just see at right. You need eight strands of each of three colors, that is, twenty-four in total. Keep the strands short for your first practice braids – I suggest no longer than 18″. Tie all the ends together in a knot . Hold the knot in your fist having all the strands emerging from the top of your hand and then separate them into four groups. Try to align the strands as closely as possible in the order shown in the following diagram. 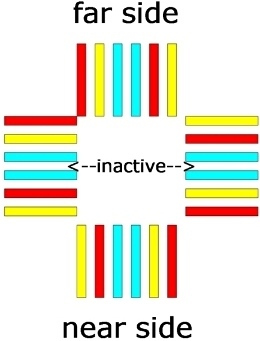 Organized in this way, you will have red and yellow “Vs” in your braid separated by columns of light blue. It will be impossible to get the strands to stay exactly in this order at first, but don’t worry about that. This is just to get them more or less in place so you can start. You can also see the strand order in the photo below left. Once you are braiding, only two sets of strands are worked together at any one time. 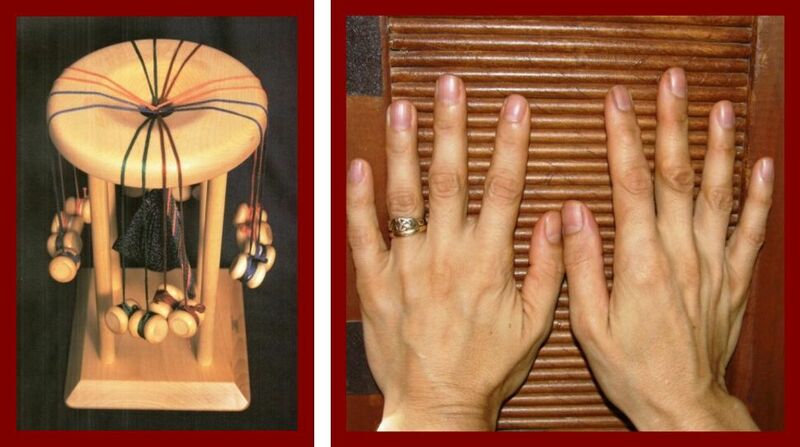 You work with the near and far side sets while the other two sets are hidden in your fist, clasped against the braid itself as you can see in the photo below at right. LEFT: The four groups of strands. RIGHT: Grasping the strands in the fist. Well, I hope these video instructions were clear for you. Remember that yellows always pair with reds and vice versa and that you are always working from left to right across the strands. In your very first two moves, you won’t need to think about “uppers” and “lowers” when you work with the blues – just grab any blue and cross it over. Uppers and lowers will become apparent after that. Tug lightly on each strand before you cross it. Starting is the hardest part as the strands will be loose and wandering about. After the first sequence, however, they will begin to sit naturally in their correct positions. 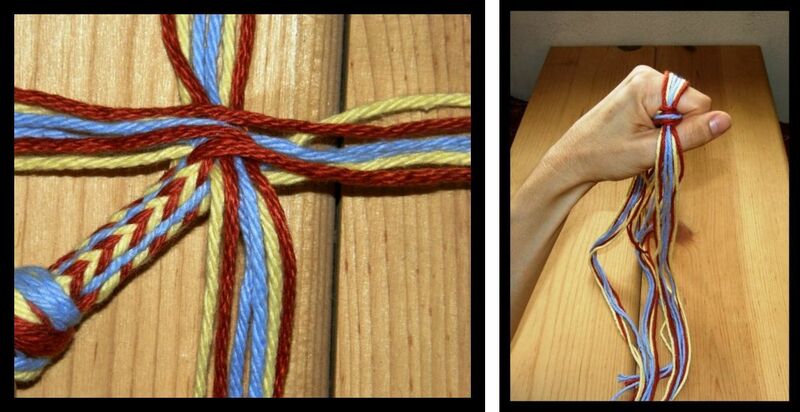 The picture at left shows how my teacher held the strands while braiding. All the ends were wound into butterflies and his hand was tilted so the strands all hung down. It looks like a mess and the strands occasionally wrap around each other, but it works! Strands are going this way and that and then you open your fingers to reveal this gorgeous braid. This is the first time I will be using a braid for a bag strap – let’s see how it goes. I will be braiding on my flight to San Francisco as I am putting some woven pieces in the gallery at the conference and hope to use the braids to hang them. This is one of those things I just didn’t get around to doing so I guess I should stick to four-strand braids for this so I can get them done quickly. Trini in Ecuador having a go on my drop spindle. 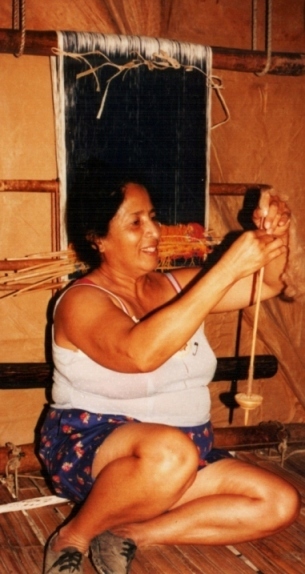 typical Bolivian spindle. The weavers in Guatemala knew nothing about llamas or llama fiber so it was fun to show them pictures of llamas and samples of the fiber as well as some things I had woven with it. Those in coastal Ecuador had never seen drop spinning so it was nice to be able to teach them a little. Spinning, unlike pick-up weaving and braiding, is something I can manage while chatting with people. I do like hunting for typical spindles and unusual whorls on my trips and this usually leads me off the beaten track. Having a spindle on me is always a good ice breaker. Not everyone can weave but in the villages of Bolivia it seems almost everyone can spin a bit or at least use a spindle to respin or ply yarn. They actually think I am a little mad when I say I want to learn – “What is there to learn? 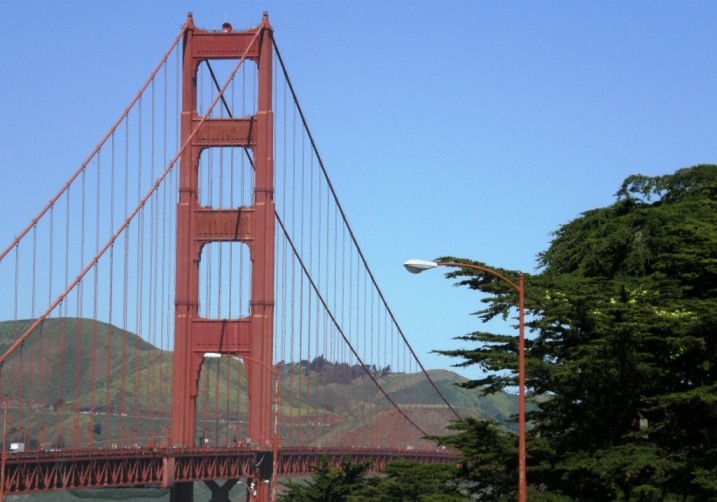 Even my four-year old son can do it!” – they tell me. LEFT: Typical drop spindles sold in the Bolivian markets. RIGHT: A few of the spindles that I have collected in my travels. 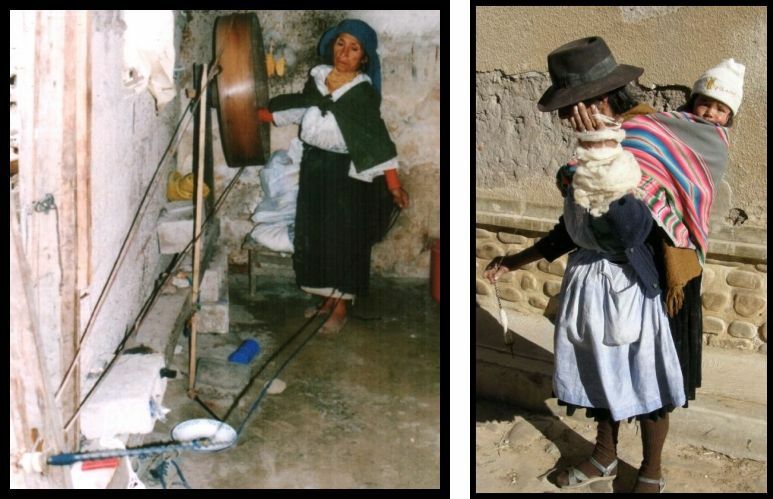 LEFT: Spinning in Yanque, Peru RIGHT: Salasaca, Ecuador where the spindle called ‘sigsig’ is made from pampas grass stems. The wool is spun to be woven on floor looms into the cloth from which skirts and shawls are made. LEFT: Spinning in Otavalo, Ecuador RIGHT: Spinning on the way home from the market, Tarabuco, Bolivia. 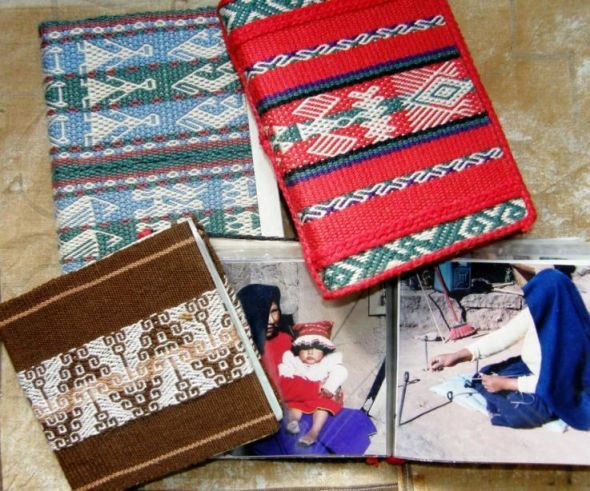 And last of all I take my small photo albums with pictures of weavers, looms and textiles from around South America to show weavers and travelers. 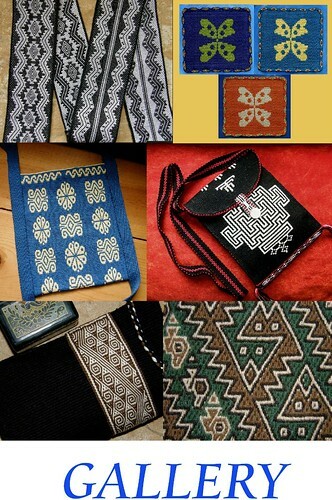 I also have another album with small samples of various motifs I like to weave. In Salasaca they treated this like some kind of shopping catalog and started making orders selecting motifs for belts and purses! Now is there any room left in the backpack for clothes and stuff? Late addition to this post…here is Stitchwort’s “S” design band from last week’s tutorial on her inkle loom made with her own handspun yarn. 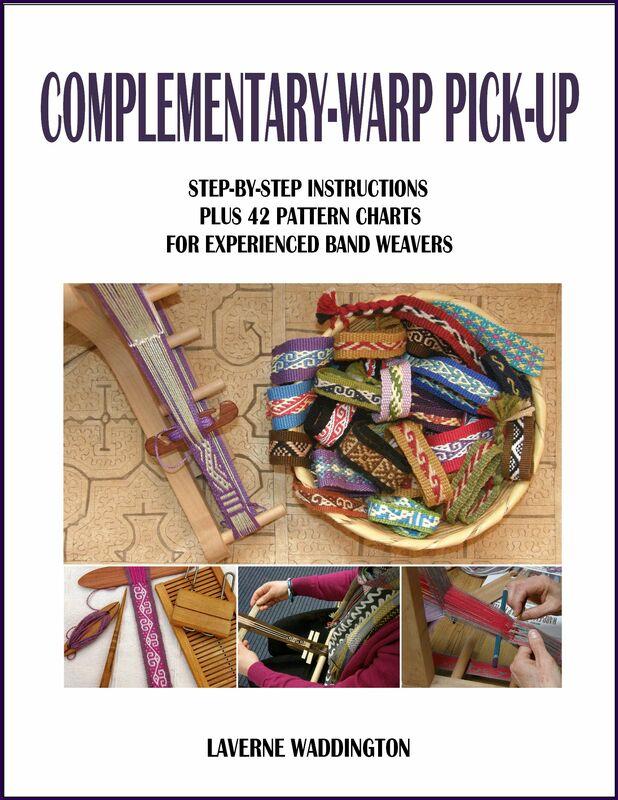 So if you have been wanting to try these techniques but have been a bit dubious about getting strapped into a backstrap loom, take a look at the lovely band that she has turned out. By the way, I am in love with her little shuttle and she made that herself – check it out on her blog. 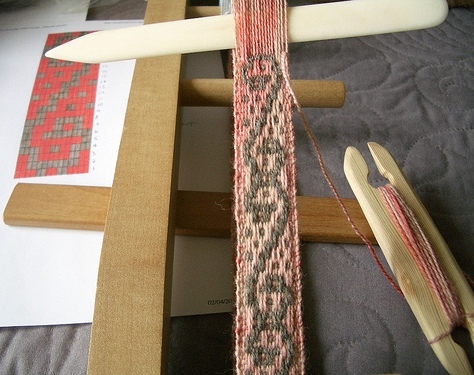 The only drawback with the inkle loom that I can see is width limitations but for a band like this there is no problem. One Weavolution member did mention that these types of weaves put a lot of strain on the inkle loom so that is something to bear in mind – just in case! I am hoping to come back from CNCH a lot wiser about inkle looms! TRAVEL UPDATE…WEDNESDAY: Yay I made it. Both my luggage and I got to San Francisco. I have one day to recover from the trip before the conference. Gorgeous day here today – I even got sunburned. This is one of the places I wanted to see but, wouldn’t you know it?-it was closed just today to prepare for an exhibition. So I had to satisfy myself with pressing my nose against the window and looking at all the lovely things. THURSDAY: Dim sum breakfast in lively Chinatown, San Francisco before heading down the coast to Santa Clara. The ocean!-something I miss in Bolivia. At the Convention Center- meeting other weavers and a lesson on spinning angora rabbit fiber from Janet, a Weavolution friend, using spindles with bead whorls. A couple more “on the road” weaving tools belonging to my roomies here at the conference. LEFT: Janet’s mini inkle loom which she let me play on last night. RIGHT: Connie’s cool C Cactus Flower Navajo loom with her cute miniature rug. It is funny that I have run into this Cactus Flower loom here because I saw one for the very first time last weekend when I was emailing my first weaving teacher – a lady here in the US who taught me Navajo style weaving. This is where I first got my start in weaving back in 1995 and, seeing as I am here once again in the US where it all started, I hope to blog a bit about my first weaving teacher and my adventures in Navajo style weaving next week. 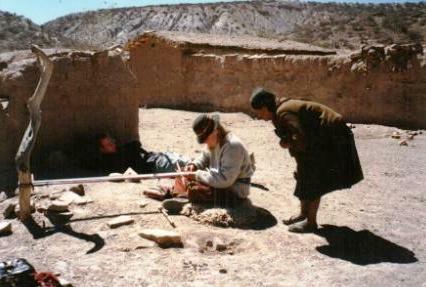 I have always lamented having to leave my huge Navajo loom behind in Chile when I moved to Bolivia in 1998. Now you can just pop a Cactus Flower loom in your bag and hit the road! Hi Jess, glad you like it. Hope you can use it! Buenisimo este tutorial! Yo sabia hacerlo pero se me habia olvidado, así que me encantó recuperar ese conocimiento. ¡Gracias por compartir tanto con nosotros! Que bien Luchi! Donde lo aprendiste? Looks like you are having fun! I shall have to give that braid a go, it looks nice and sturdy! Keep safe and enjoy the rest of your trip! Yep that’s a sturdy braid. I think it will make a good bag handle-just have to figure out a good way to attach it. Your site is very inspiring. I’m leaving on a trip tomorrow, when I come back home in a couple weeks I’m going to sit down and study your videos. (The sling braid is beautiful, really different than any I’ve done.) Just wanted to tell you that you were the highlight of cnch for me! I didn’t sign up for classes, wasn’t expecting to get to see anything as exciting as your backstrap demo. Plus your experience and encouragement with video tutorials…THANKS for coming all this way and sharing so much! Thanks so much for visiting. I loved watching you teach with so much enthusiasm at cnch and seeing how much everyone was enjoying your instruction. That was a fun corner we had over there. Hope some day some where we get to do it again. Looking forward to seeing your videos some time soon. 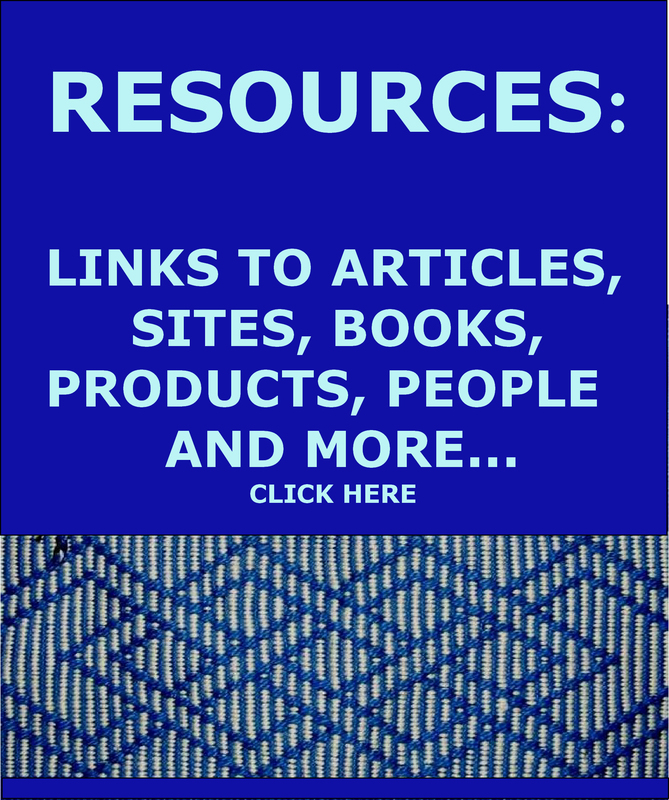 You have a wonderful website and it’s a great learning tool. I wanted to know more about your Margarita braid technique. I have seen it before but there is no information regarding it. Would you please discuss this technique more, it would be greatly appreciated. I plan to do a tutorial on this with a video once I am back in Bolivia after this trip. Give me a couple of weeks. What an Awsome blog you have! 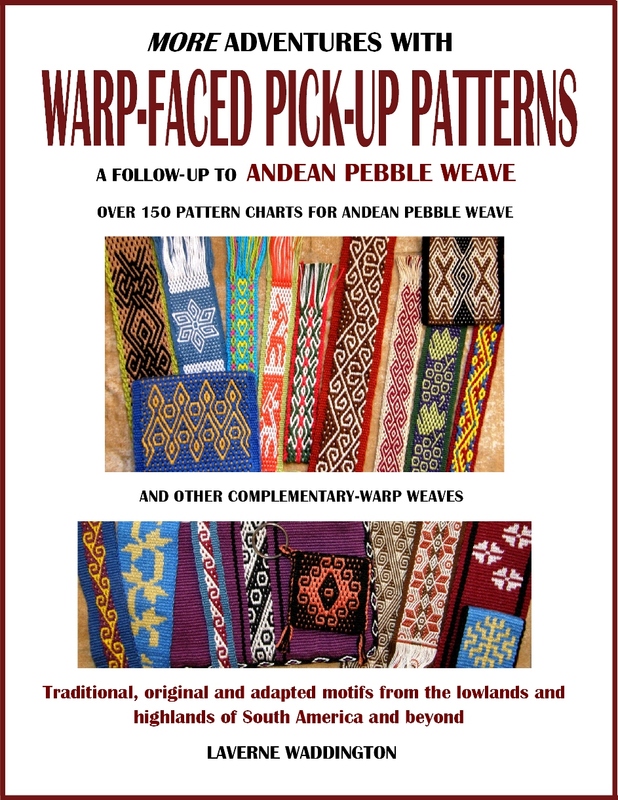 Thankyou for posting the video on the Palma braid, I love Andean/Tibetan braiding and havn’t seen this pattern before. I will have to give it a go! This is just my way of working a 16 strand spiral braid as set out in “Sling braiding of the Andes” by Adele Cahlander. Would love to see some more of your braids, Ben. Hope you will give weaving a try. I loved hearing your Aussie accent on the video! Hope you’re having fun on your trip. I have a question; What length is your travel sized warping board that you incert the long screws in? I purchased some long screws and discovered I already had some in one of my drawers and I purchased a couple of 99cent yard-sticks. I can cut one in half, glue the two pieces together to give it more strength and drill the 4 holes in for the screws. I also found a wooden stake lying on the ground near a construction site that looks like the same length your travel warping stick is. It’s cut on one end to a point, but I can cut that off. The wood feels kind of rough, but I can sand it down some and paint it to give it a smoother touch and prevent yarn from snagging on it. It’s nice a stiff like a wooden ruler. You told me even an 18″ wooden ruler will work? I found a few around my office from past employees or offices that were occupied in the past. I think it is 18-20″ long, Cookie. It is buried in my luggage right now. It has holes drilled in it in various places so I can adjust the warp length and use two or four-stake warping. Try to not drill the holes too big. You should have to kind of force the screws into the holes and then tighten the nut. If the holes are too big the screws will lean as you warp. I slide a cut piece of plastic drinking straw over the screws so that the yarn does not catch in the screw threads.